A stroller is just as necessary as a crib if you ask me. Even if you’re a Gen Zer or a millennial like me who prefers the convenience of ordering stuff online and having it delivered to you, you can’t stay at home with your baby forever—and trust me, you won’t want to. A stroller is useful when you need (and want) to leave the house, whether it’s running to the store or running for exercise. But the dilemma every parent faces is making sure their baby is both safe and comfortable while riding in a stroller. From stroller accessories to stroller dos and don’ts, here’s how to keep your baby safe and comfortable in a stroller. Stroller weather shield —Wondering how to cover your stroller in the rain? Well, wonder no more. All you need is this handy stroller cover. 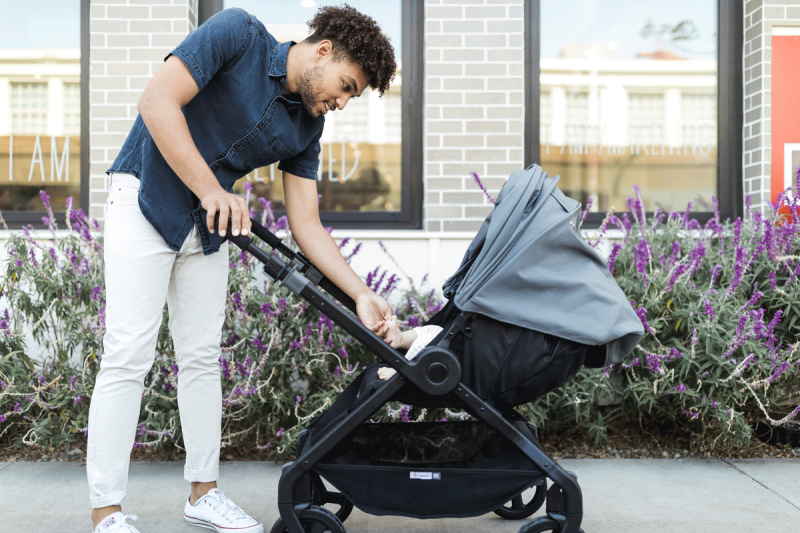 It protects your baby from wind, rain and snow, and most shields have great ventilation so your baby can ride comfortably no matter the season. Safety wrist strap — Whether uphill or downhill jogging, walking in a busy city or trying to handle multiple kids (human or fur babies), a strap ensures the stroller won’t roll away from you. It gives you freedom to take a drink, while still keeping your child close and safe. Stroller toys — Older babies will get bored on long walks and shopping trips. Keep them happily entertained with stroller toys, like an activity arch or a musical toy that attaches to the car seat handle if your infant sits in their car seat inside the stroller. Car seat adapter — While your baby is an infant, or if your baby just prefers being in their car seat, you might have to buy a car seat adapter that allows you to snap your car seat onto the stroller. 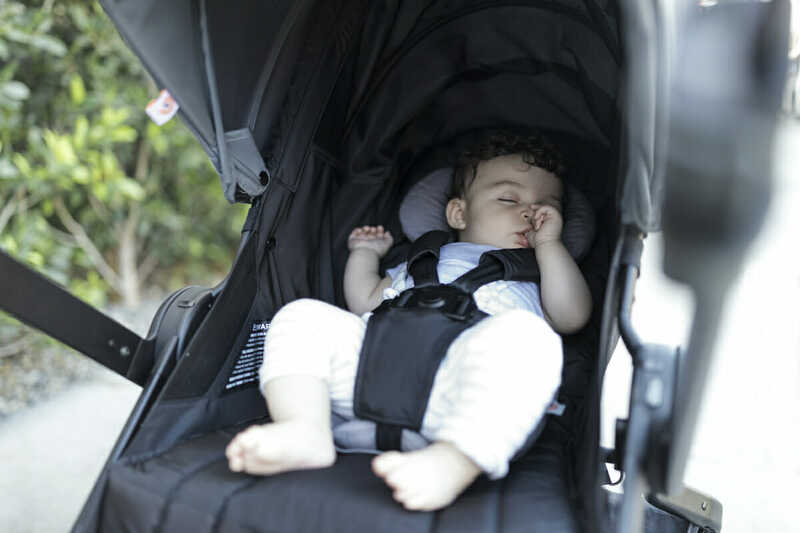 This stroller accessory is loved by most parents because it means you’re less likely to wake your sleeping baby when you move them from the house or car to the stroller or vice versa. Cushioned body supports — For most newborns, a full body cushion provides head and neck support, along with the added comfort they need while in a stroller. Once you pass the newborn stage, you can also find stroller cushions or blankets for your baby to lie on. Shoulder strap covers — Stroller straps aren’t the most comfortable material. To prevent irritation from the material, get some soft shoulder strap covers for skin protection and extra padding for extra comfort and neck support. Clip-on stroller fan — When there’s not a breeze and you have to be out and about, keep your babe cool and comfortable with one of these fans. They attach to strollers easily; just be sure to keep the fan away from your baby’s fingers. Besides certain accessories, a key way to keep your baby comfortable in their stroller is putting them in the right clothes. Choose clothes that keep the straps from rubbing on their skin, and make sure their clothes or blanket are keeping them warm in cooler weather and not making them too hot during warmer days. Another thing I never thought of until talking to some other parents is finding a walking speed your baby likes and time of day they prefer. Some babies love riding in a stroller no matter the time of day or pusher’s pace, but others don’t. You may need to take some stroller test runs with your baby to learn if you’ve got a stroller lover or if your baby only prefers 5 mph jogs at 7 a.m.